A couple years into his time at the University of Virginia, Jesus Gomez was worried he would never find his calling. The first-generation college student had started out as a biology major thinking he would head to medical school. Then he thought he wanted to go into biomedical engineering. Then he figured kinesiology might be for him. But at a meeting for students interested in kinesiology, Gomez began talking with Dr. Filip Loncke – an associate professor at the Curry School of Education who was seated nearby. Gomez became fascinated by the workings of the inner ear. “Once you lose your hearing, a lot of your other senses try and compensate,” he said. 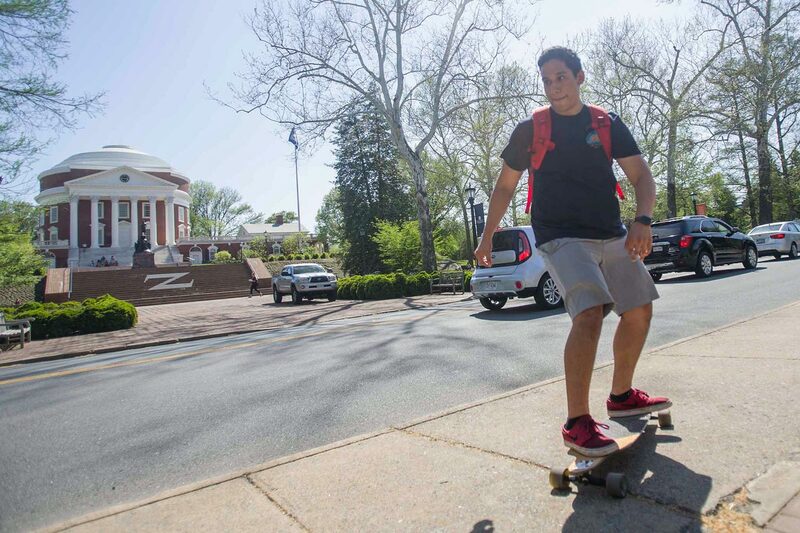 Next week, Gomez will graduate with a degree in speech communications disorders from Curry, wrapping up a collegiate career that included volunteer Spanish interpreting at the UVA Medical Center, leadership roles in student organizations – and a penchant for zipping across Grounds on his skateboard. As a child, Gomez suffered from asthma and endured frequent visits to see doctors. It was during those visits that he realized he wanted to someday work in a career where he could help others. 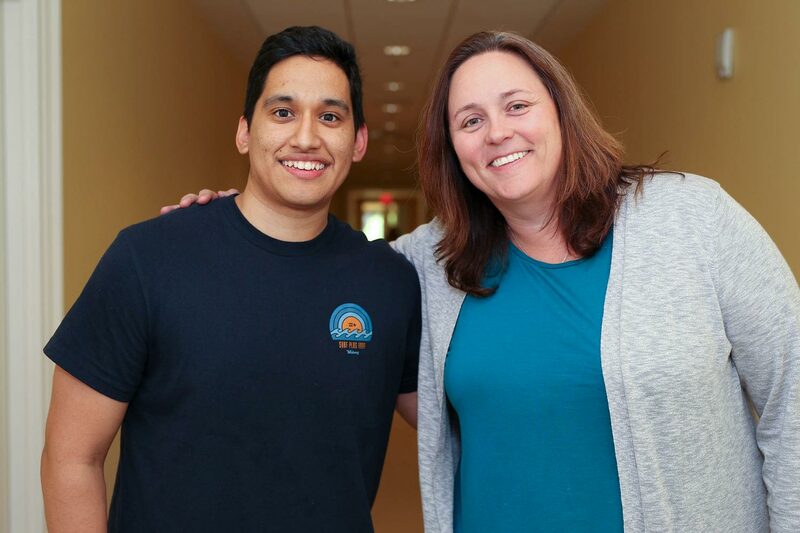 Gomez said he doesn’t know where he’d be without Kristin Roush, an assistant professor in the Curry School Department of Human Services’ Speech, Language, Hearing Center (part of the Sheila C. Johnson Center for Human Services). When Gomez was just getting started in his major, she was his sounding board. If you’ve ever bumped into Gomez on Grounds, chances are he’s been toting his skateboard. Gomez was born in Lima, Peru – but he grew up near Kitty Hawk on North Carolina’s Outer Banks, where skateboarding, surfing and other outdoor sports are ways of life. Gomez is a member of Latinx Student Alliance, Christian Students at UVA and served as the treasurer in Curry’s chapter of the National Student Speech Language Hearing Association. In his spare time, he volunteers at the UVA Medical Center as an interpreter. “Being bilingual – it’s very easy for me to talk to other people,” he said. Gomez said his parents, who sacrificed a lot for him to come to UVA and who now live in Virginia Beach, can’t wait to see him walk the Lawn. 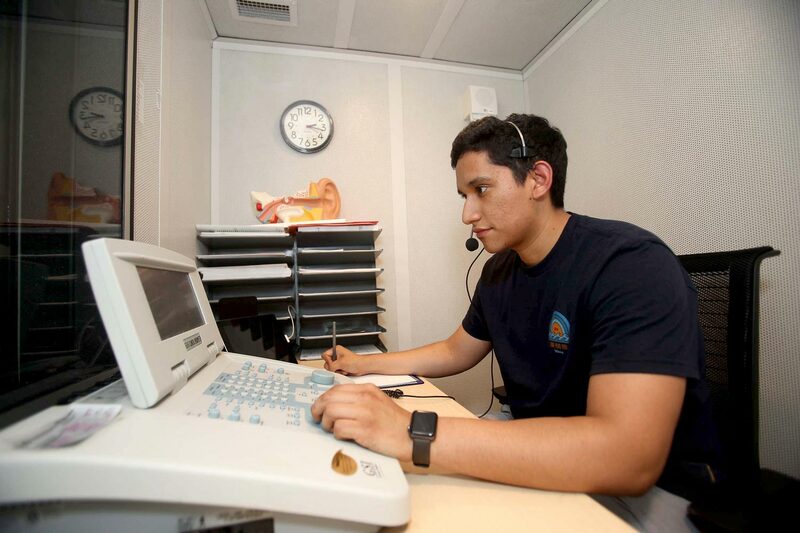 In August, Gomez will begin work on his doctorate in audiology at the University of Tennessee. His goal is to become an audiologist. Gomez smiled as he talked about his four years at UVA. “I don’t think it went exactly how I thought it would go,” he said, “but I think it was definitely the way that it was supposed to go, if that makes any sense. I’m a firm believer in what’s meant to be is meant to be. Initially, I was very focused on being an M.D., but I think I found my path through trial and error and just talking to people. “I think that’s one thing I’ll really take away from UVA is that I’ve learned how to talk to people and seek help if I need help. That’s really pushed me to become a better student and I think a better person overall.